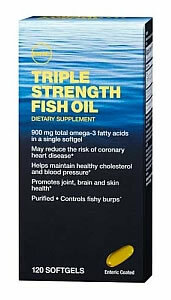 GNC Triple Strength Fish Oil: Buy Now! Beneficial fatty acids found in supplements such as fish oil and flax oil are proven to maintain healthy cholesterol and blood pressure levels. They're also loaded with proven benefits for your brain, eyes, skin, joints and heart. Omega-3 and Omega-6 Fatty Acid supplements are available in both capsule and liquid form. 1. Bourre JM. Biomed Pharmacother 2007;61(2-3):105�12. 2. Benatti P, et al. J Am Coll Nutr 2004;23(4):281�302. 3. Kris-Etherton PM, et al. Am J Clin Nutr 2000;71(1 Suppl):179S�88S. 4. Kris-Etherton PM, et al. Circulation 2002;106:2747�2757. 5. Volker D, et al. J Rheumatol 2000;27(10):2343�6. 6. Curtis CL, et al. Proc Nutr Soc 2002;61(3):381�9. 7. Uauy R, et al. Lipids. 2001;36(9):885�95. 8. Hogstrom M, et al. Am J Clin Nutr. 2007;85(3)803�7. 9. Weiss LA, et al. Am J Clin Nutr. 2005;81(4):934�8. 10. Stordy JB. The Lancet 1995;346(8971):385. 11. Helland IB, et al. Pediatrics 2003;111(1):e39�44. 12. Salem, Jr, N, et al. Wrld Rev of Nut and Diet 1994;75:46�51.